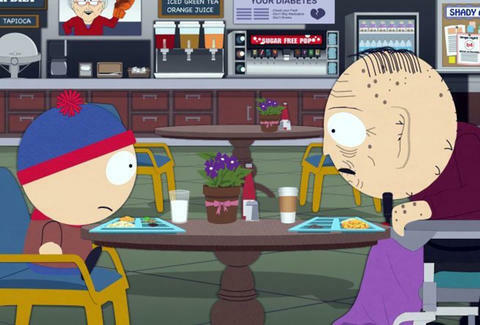 The following post contains spoilers from South Park's "Hummels & Heroin." "Today we are facing an epidemic of catastrophic proportions -- who will join me in finding the source of these opioids and eradicating them from our community?" Turns out the senior citizens of South Park were pushing pills via crochet pillows, working as cogs in the prescription drug machine. Stan quickly found himself at the center of the drama, dealing the pillows to ensure his grandfather's survival at the hands of a menacing (and stinky) queenpin. The plot line served as a fun way to answer where Marvin Marsh had gone -- seeing as the show had kinda discarded him. And his circumstances allowed the writers to underline the problems of the U.S. opioid crisis while highlighting both the flaws of the country's justice system and the prison-like realities of its retirement homes. The zany episode, very much in line with this season's self-contained return to form, was made all the more hilarious by a pair of musical interludes, including a rap performed by Killer Mike (above). Enjoy.